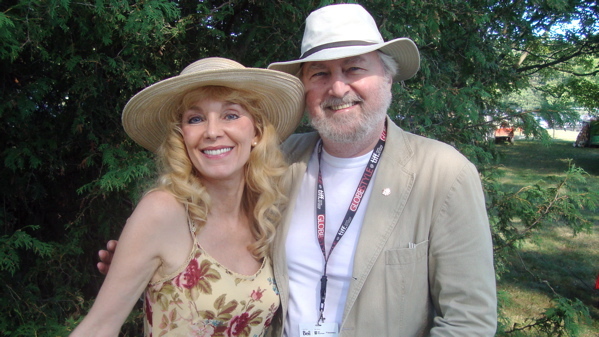 One of the treats at the Toronto International Film Festival is Norman Jewison’s annual picnic at the Canadian Film Centre and it was a pleasure there today to meet the London-born Canadian classical guitarist Liona Boyd. We have Notting Hill, Toronto and Los Angeles in common. I asked the acclaimed musician, who is now a singer/songwriter, about her film work and she recalled the time she played solo for Maurice Jarre when he scored Alfonso Arau’s 1995 Keanu Reeves picture “A Walk In The Clouds”. She said she was in awe of the Los Angeles session players but was nonetheless disappointed not to see her name listed with the rest of the orchestra when the CD was released. “Then I turned it over and saw that it said I was featured as a special guest of Maurice Jarre, and I felt very embarrassed,” she said. Boyd has a new album due out and lots of her great recordings are still available widely. It’s all wonderful stuff. Norman Jewison was on hand as usual to greet the hundreds that show up for a relaxed barbecue in the sunshine. There was an appropriate acknowledgment of 9/11 and then Jewison spoke about the growth and significance of the CFC, which he did so much to support. He noted that the movie business isn’t built on banks and financing, but on talent. This entry was posted in Film, Music, Notes and tagged Canadian Film Centre, Henk Van der Kolk, Liona Boyd, Maurice Jarre, Norman Jewison, Ron Base, Toronto International Film Festival. Bookmark the permalink.